Today, essentially, marks the 100th anniversary of the start of World War I. It is still one of the most savage wars the world has ever known. It left nearly 2% of the world’s population dead: 23 million. There is a good reason those who fought it were called the Lost Generation. Sealed button-filling pens and take-anywhere ink tablets were revolutionary new creations for sailors and doughboys hoping to write home during the first world war. Yet, there’s no reason wholesale slaughter shouldn’t prevent the tide of marketing. 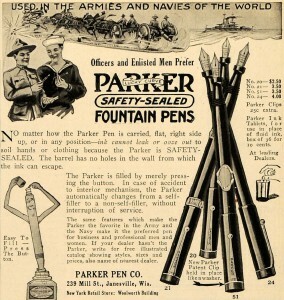 Parker had a particularly fascinating line of pens aimed directly at servicemen in the trenches. These pre-Duofold pens were considered “sealed” and leak proof. Best of all, you no longer needed fragile glass bottles of ink, which would not withstand the rigors of combat. 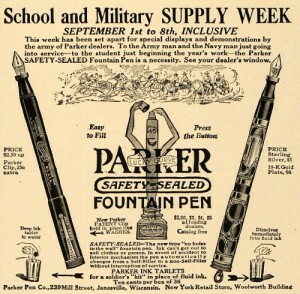 Parker sold special ink tablets. These dried tablets could be dropped in a cup of water or any other small container for a nearly instant supply of ink to fill a pen and write your family or sweetheart back home. These ads come from around 1917, when the United States officially entered the war, which ended Nov. 11, 1918. 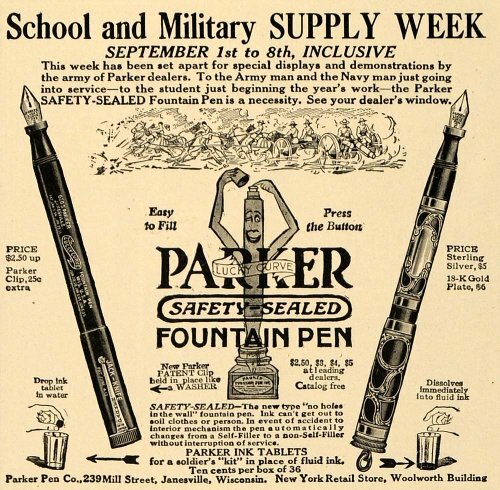 Enlist the safety-sealed button filling Parker pens for your needs at school or while fighting in the trenches in this classic WWI Parker ad. Please note the artillery is being moved by horses in the ads. This would be the last war to see horses used with any widespread practical regularity. It also would be the last to see swords and lances issued with actual intent for battlefield use. (Yes, the Japanese issued swords in WWII, but they were strictly weapons of last resort.) Cockades and spikes also saw their last use on helmets. Battlefields would be dominated by machine guns and the newly invented tanks. Oceans were devastated by submarines. And for the first time, aircraft could fly over enemy territory to observe movements, attack with machine guns and drop bombs. Cars and trucks came to play vital roles. Motorized ambulances saved countless lives. And chemical warfare would devastate countless people with agonizing pain and misery…if not death. Getting back to the ads, I love that a pack of more than 30 ink tablets cost only 10 cents. Do any of these tablets still exist? I would love to see some and try one. 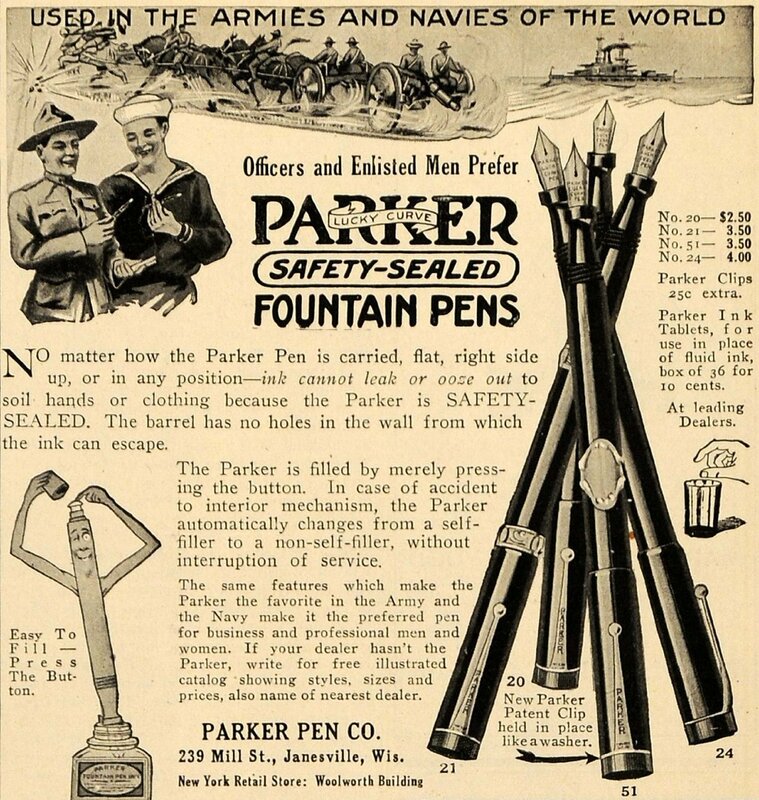 This entry was posted in Pen Ads of Yesteryear and tagged antique Parker, antique pens, army pens, button filling pens, classic parker pens, ink tablets, navy pens, old ink tablets, Parker Duofold, vintage parker pens, vintage pens, war pens, World War I, World War I pens on August 1, 2014 by Nathaniel Cerf.